Spiros Papaefthimiou was born in 1971 and he is married with 3 children. He grew up in Rio Patras but he is now a permanent resident of Chania, Crete. He graduated from the Physics Department of the University of Patras in 1995 and then received an MSc and a PhD from the same Department in 1997 and 2001 respectively. From 2012 Spiros is a member of the academic community of the Technical University of Crete, and he is currently Associate Professor in the School of Production Engineering and Management. He belongs to the Academic staff of the Industrial, Energy and Environmental Systems Lab, leading the research group of Systems and Technologies for Energy Conservation and Management. His research interests are in the fields of smart devices and technologies for energy saving and energy management, with specific applications in areas such as Ports and the environmental consequences of their activities. 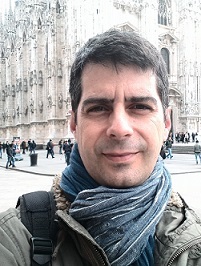 Spiros teaches graduate and undergraduate courses, he is a member of various international scientific bodies and acts as a reviewer for journals and conferences. He has participated in several European and Greek research projects, while his scientific work includes articles in international journals, books and presentations at conferences.